Making Your Demand Our Business. The MSMC and MSA work to develop and grow opportunities for Missouri’s soybean farmers and Missouri-grown soybean, as well as our allied industry partners. Ongoing projects range from facilitating networking opportunities across industry to investing in leading breeding programs and industrial uses of soybean oil and meal. The Missouri Soybeans team has a strong track record of success and stands ready to assist. Contact any member of the Missouri Soybean Association and Missouri Soybean Merchandising Council staff for more information. The Missouri Soybean Merchandising Council commissioned the Economic Contribution of Missouri Soybeans study to assess the economic activity associated with the state’s soybean production and processing industry. 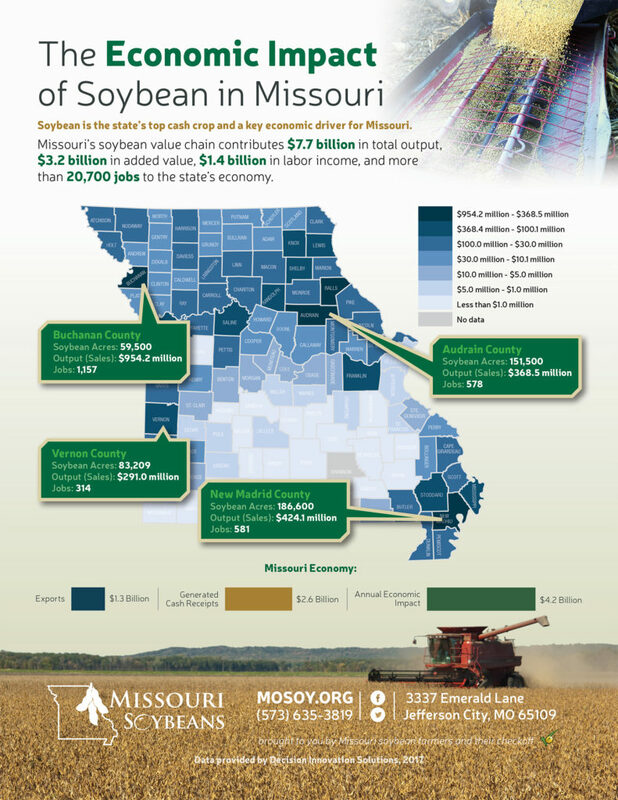 The study identified a $7.7 billion output for Missouri’s soybean value chain, $3.2 billion in added value, $1.4 billion labor income and showed support of more than 20,700 jobs. See the statewide report by clicking here. To view county-specific information, visit mosoy.org/economiccontributionreports. Paseo Biofuels is a New Generation LLC made up of over 600 Missouri farmer members that own 53 percent of a 40 million gallon (annually) biodiesel production facility and glycerin refinery in Kansas City, MO. 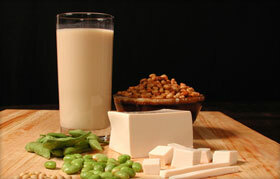 Cargill owns the other 47 percent of this joint venture. The operation is located next to Cargill’s soybean crush plant near the Paseo Bridge over the Missouri River. An eight-member J.V. board comprised of three representatives from Cargill and five farmers elected from the 11-member board of Paseo Biofuels oversee the LLC. Located in Mexico, MO, Mid-America Biofuels is a joint venture of Biofuels, LLC (a farmer-owned biodiesel business), Ray-Carroll County Grain Growers, MFA Oil Company, Growmark Inc, and Archer Daniels Midland Company (ADM). Mid-America Biofuels has achieved Accredited Producer status under the BQ-9000 program, a voluntary fuel quality assurance program adopted by the National Biodiesel Board and the Canadian Renewable Fuels Association. Mid-America Biofuels is committed to producing only the highest quality biodiesel that will meet or exceed all industry specifications. The Bay Farm Research Facility exists to support and facilitate the research, business and market development and educational programs of the Missouri Soybean Merchandising Council and Missouri Soybean Association. Since its official opening in August 2012, the facility has been home to a collaborative effort between respected soybean scientists and Missouri farmers. The 160-acre facility operates under the mission to conduct high-quality research responsive to the needs of Missouri soybean producers, to showcase the importance of biosciences in agriculture, and to support Missouri’s soybean industry in bringing reliable, safe, sustainable and profitable products to the marketplace. Ongoing projects include efforts to develop soybean varieties and value-added traits that will optimize soybean yields and improve the profitability and competitiveness of soybeans grown in Missouri. Analysis of varieties’ yields, nutritional value and oil content conducted at the facility directly impacts the bottom line of Missouri soybean producers and supports other researchers’ work in Missouri, across the U.S. and around the world.